In 2015, Noth Carolina lost three games to Sout Carolina, Clemson and Baylor all on a neutral field site. Georgia’s ten victories last season came to opponents with a combined record of 51-72 overall or .414%. The Bulldogs lost three games in 2015 to Alabama, Tennessee and Florida. Those opponents had a combined record of 33-9 overall or .785%. Former Alabama defensive coordinator Kirby Smart is now head coach at Georgia. Smart is a former Bulldogs player that was with the team in the early 1990’s. Last year, the Tar Heels averaged 40.7 points per game and had a very balanced offensive attack led by quarterback Marquise Williams. North Carolina rushed for 224 yards per game and passed for 262 yards through the air with Williams throwing for a total of 24 passing touchdowns. Williams was a dual threat for the offense and recorded 13 rushing touchdowns last season in leading his team to a 11-3 overall record. This season, the Tar Heels will need to make up for his departure and should turn to backup quarterback Mitch Trubisky week one of the season. Last year, Trubisky played in key situations filling in for Williams comppleting 85% of his passes for 555 yards with 6 touchdowns and no interceptions. Running back Elijah Hood returns and should be a main component of the offense in 2016. Last year, Hood rushed for 1,463 yards averaging 6.6 yards per carry with 17 touchdowns. Wide receivers Mack Hollins and Ryan Switzer return giving the Tar Heels big play threats to take the top off of opposing defenses in the 2016 season. Last year, the duo combined for 85 receptions for 1,442 yards with 10 touchdowns. When looking at the team’s three losses last year, the offensive deficiences were apparent in the passing attack. In those games, the offense averaged 221 passing yards per game, 41 yards less than their season average. In order to make a run at the ACC title, the team must be more consistent in the passing game. This will take the pressure off of Hood to carry the load for the offense and give the Tar Heels more options offensively in big games. Defensively, the team allowed 24.5 points per game and was mediocre in run support allowing 247 rushing yards to their opponents. However, the secondary played very well yielding 188 passing yards per game to opposing offenses. The front seven recorded 23 sacks as a unit through 14 games and will need to do a better job in 2016 to put pressure on opposing quarterbacks. North Carolina was +7 in turnover margin, however, on the road or on a neutral field the team was -4 in turnover margin. In looking at the team’s three losses, the defense failed in shutting down the run. In those games, the unit allowed 406 rushing yards per game and was exploited in allowing Baylor to rush for 645 yards in their bowl win over the Tar Heels. In the loss to South Carolina-the unit gave up 257 rushing yards. In the loss to Clemson-the unit allowed the Tigers to rush for 319 yards on the ground. That cannot carry over to the 2016 season if North Carolina is going to build on their success from last year. The Bulldogs averaged 26.3 points per game in 2015, which was their lowest total since prior to the 2008 season. A big factor in the dropoff of offensive production, was the departure of offensive coordinator Mike Bobo, who became the head coach at Colorado State. Bobo understood how to utilize his playmakers and get them the football through different formations. Brian Schottenheimer did not understand hwo to utilize the Bulldogs offensive talent and forced Georgia into a “vanilla” offense that was predictable in big games last year. 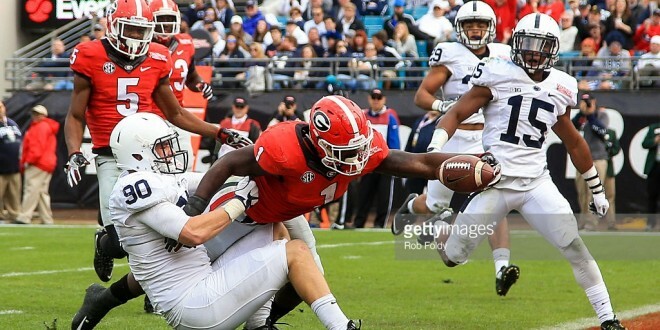 The Bulldogs rushed for 192 yards per game and passed for 185 yards per game last season. Quarterback Greyson Lambert struggled in understanding the system and did not show the veteran leadership the Bulldogs offensive staff was hoping from him, as he transferred over to Athens last year. Lambert completed 63% of his passes for 1,959 yards with 12 touchdowns and 2 interceptions in 2015. Running backs Sony Michel and Nick Chubb, both return to the offense and should give the Bulldogs one of the best running back tandems in college football. Chubb is returning from a severe knee injury suffered in the loss to Tennessee and is ahead of schedule as spring camp opens up. Last year, Chubb rushed for 747 yards averaging 8.1 yards per carryw ith 7 touchdowns, while Michel led the team in rushing with 1,161 yards averaging 5.3 yards per carry with 8 touchdowns on the ground. When looking at the offensive weaknesses in 2015, there were two areas that were of major convern entering this season-the passing game and third down efficiency. In the team’s three losses to Alabama, Tennessee and Florida-the offense completed 41 of 98 passes (41%) with 2 passing touchdowns and 7 interceptions. The Bulldogs also converted only 31% of their third down attempts in 2015, which was their lowest total since prior to the 2008 season! In comparision to the previous three seasons, the third down production was much less than previous years (49% in 2014, 41% in 2013 and 47% in 2014). That cannot continue this season if Bulldogs are going to make a run for the SEC East title. Defensively, the Bulldogs allowed 16.9 points per game and was very solid in both stopping the run and pass last season. The unit allowed 149 rushing yards to opposing offenses and yielded 156 passing yards per game to opposing quarterbacks. The team was +4 in turnover margin and played very well on the road with a +6 margin. However, at home, the team was -2 in turnover margin. Two areas of concern last season was the team’s inability to generate a consistent pass rush and the team’s inability to stop the run in big games. Last year, the Bulldogs recorded 21 sacks as a defense which rank in the bottom third of FBS (97th of 127 teams). In the team’s three losses, the unit allowed 218 rushing yards per game which was 69 yards more than their season average.